SMELLEZE Reusable Human Scent Remover Deodorizer: 2 Pouches to Hunt Scent Free Summary Smelleze® Reusable Hunting/Fishing Odor Removal Pouch eliminates human scents to prevent detection during hunting. Strong human smell doesn't stand a chance. 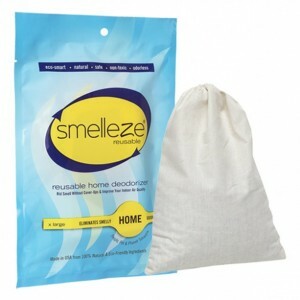 Smelleze™ is reusable & lasts a year. Safe for people, pets & planet. This eco-friendly hunting scent elimination deodorizer really works to cover scent so you can enjoy scent free hunting! Features & Benefits • Simply insert in pockets & notice the difference • Eliminates human scent without masking it • Makes it difficult for animals to detect humans • Improves chances of hunting & fishing success • Eco-friendly, reusable, safe, non-toxic, natural, odorless • Made in USA The Ultimate Hunting Advantage! Animals have an excellent sense of smell that is generally much better than that of humans. Consequently, even small amounts of odor generated by humans during hunting is easily detected by animals. This alarms game and causes them to flee resulting in loss of hunting opportunities. Covering up human scent with perfumed Odor Removal s will not eliminate human body odors and only result in hunters and fishermen being detected more easily. The Smelleze® Hunter's Odor Removal Pouch was specially developed to adsorb, neutralize, and encapsulate human scent during hunting. Smelleze® Hunter's Odor Remover Pouch will truly eliminate human body and foot odor making it almost impossible for animals to detect hunters. This is sure to result in an advantage that will greatly increase hunting pleasure. To make yourself undetectable to animals, simply place reusable Smelleze® Hunter's Smell Removal Pouch pouches in your pockets and gear. To rejuvenate periodically, simply heat in a microwave 2-4 minutes or place in direct sunlight for a day and reuse. Replace when rejuvenation does not help. 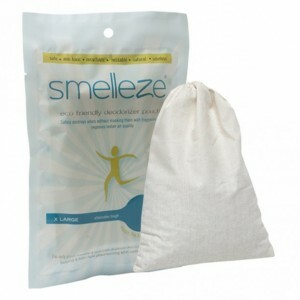 Smelleze® Hunter's Smell Remover Pouch can work for years so it is very cost effective. Smelleze® Hunter's Smell Eliminator Pouch is non-toxic, safe, reusable recyclable, natural, odorless, non-flammable and non-caustic. 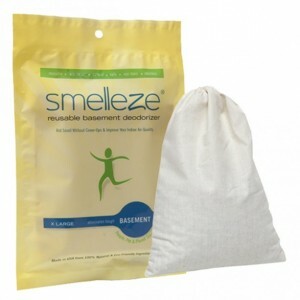 Smelleze® Deodorizer Pouch is an ideal environmentally friendly solution for eliminating human scents without adding pollutants to the air you breathe. It does not contain VOCs, harmful or ozone depleting chemicals and is especially beneficial for those suffering from allergies and chemical sensitivity. No fossil fuels are used in the production of Smelleze® odor eliminator deodorizer media.